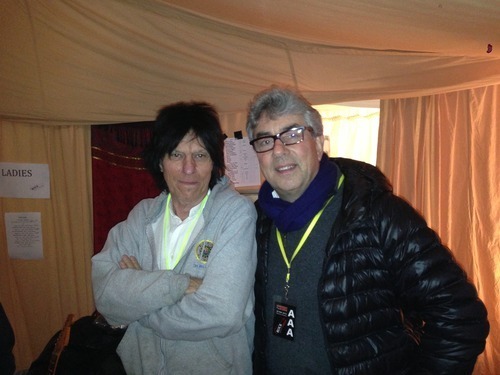 Here I am with the great Jeff Beck, unarguably the greatest guitarist to walk this earth, back stage at the ‘Concert At The Kings’ All Cannings Wiltshire for the SAS band “Rock Against Cancer” gig. Jeff played on my songs ‘Heartful of Soul’ and ‘Evil hearted you’ with the Yardbirds, as well as ‘Tallyman’ which he recorded as a solo artist. Other artists appearing were Queen’s Roger Taylor, Madeline Bell and Kiki Dee. It was a great gig for us after a viciously early start flying home from Denmark where 10cc played last night. We’re all looking forward to our rescheduled Scandinavian tour which starts next Tuesday May 28th.